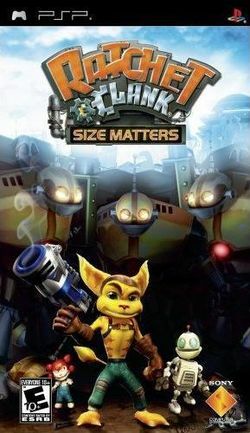 Ratchet & Clank: Size Matters is a platform/shooter in the Ratchet & Clank series developed exclusively for the Sony PlayStation Portable. It is the first Ratchet & Clank game on the PSP handheld. It was developed by High Impact Games, a company spawning from the original Ratchet & Clank developer, Insomniac Games. The story involves Ratchet and Clank as they are interrupted from their vacation to search for a kidnapped girl and encounter a forgotten race known as the Technomites. It is the first Ratchet & Clank game to get an E10+ rating by the ESRB, with the second title being Ratchet & Clank Future: Tools of Destruction for the PlayStation 3. Size Matters was released on the PlayStation 2 on March 11, 2008. While on a vacation on Pokitaru, Ratchet and Clank meet a little girl named Luna who is writing a school report on heroes. Shortly after meeting Luna, she is kidnapped by mysterious robots. Clank then stumbles upon a mysterious artifact from an ancient race, the Technomites. Ratchet and Clank then set out to save Luna. Clank suspects that Luna is actually a robot controlled by the Technomites, using the same wording Ratchet did in the original game when Clank is fooled by the Captain Qwark robot. In the process, they discover the forgotten race of smart but diminutive inventors, and also encounter Captain Qwark, who is attempting to find his birth parents. You take control of Ratchet and sometimes Clank as you embark on an adventure to rescue Luna, discover the secrets of the Technomites, and perhaps hlep Captain Qwark find his parents along the way. This page was last edited on 5 May 2009, at 23:19.